Tagliatelli is a form of pasta that comes in long thick strips. It accompanies recipes that have creamy based sauces that coat the strands of pasta so every forkful is a delight to taste. 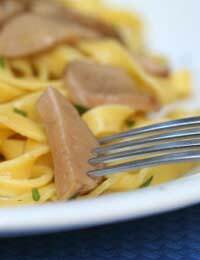 Mushroom Tagliatelli is perfect for a quick meal and ideal for vegetarians. Purchase an assortment of dried pasta for your store cupboard so that you can whip up any pasta meal in minutes. Try to use an assortment of mushrooms for this recipe as the flavours and different sized pieces will enhance the dish. Never wash your mushrooms simply brush them clean and peel away any blemishes. Place the pasta into a large pan of salted boiling water and cook until it is soft but still has a ‘bite’ to it. At the same time heat the oil in a pan and cook the onion until soft but not brown. Add the garlic and cook for a further two minutes. Add the mushrooms and continue cooking for about five minutes until the mushrooms are cooked through. Add the wine and continue cooking for two minutes. Stir in the cream and allow the sauce to simmer gently until it has thickened. Add the basil and the drained pasta. Season to taste and serve at once. As you can see this is a quick and easy recipe but looks and tastes stunning. There are similar pasta recipes that can be used for similar effect. Cook as above but omit the wine and mushrooms and at the onion stage also cook four slices of chopped lean bacon. After adding the cream to the recipe also stir in a heaped tablespoon of parmesan cheese. Take two chicken fillets and chop into small pieces and cook in two tablespoons of olive oil with a chopped small onion and one chopped garlic clove. When cooked through add ten fresh cherry tomatoes and a small tray of cleaned button mushrooms along with the juice of one lemon and a good pinch of tarragon. Add the cooked pasta and serve at once. Cook as for the mushroom Tagliatelli but use half of the mushrooms. When adding the cream also add 250 g of smoked salmon cut into bite sized pieces – delicious! Fish and shellfish go extremely well with pasta and almost any type of fish can be added to the mushroom tagliatelli recipe although you may wish to lower the amount of mushrooms or replace them with simple button mushrooms instead. Try pieces of smoked cod or haddock or perhaps monkfish, prawns, scampi, mussels or even squid. If serving the recipes to children remember to omit the wine.